Shabana Azmi spent a large part of Monday evening living out a dream. Our resident feminist-actress spent hours with the grand-mistress of the feminist movement Gloria Steinem. Steinem flew quietly into Delhi earlier this week. Shabana, a long-standing admirer of Gloria’s beliefs has never made any bones of the fact that much of her ideology as an actress and an individual has been moulded by Ms Steinem’s thoughts. “She’s definitely a role-model,” says Shabana, herself a role-model to generations of women in India. 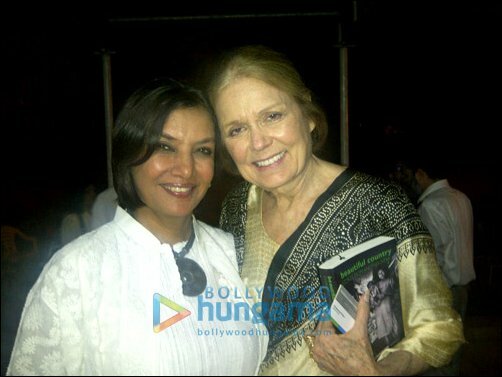 Shabana who was in Dubai performing her long-running play ‘Tumhari Amrita’ flew in to Delhi on Monday to meet Gloria Steinem. Steinem and Azmi’s meeting lasted much longer than it was expected to. It would be no exaggeration to say Shabana came satiated from the historic encounter. Ms Steinman was dressed in simple pastel saree. Should we consider that the ultimate raveling of the feminist movement? The two powerful women parted with the promise of several crucial collaborations on matters that consider women’s empowerment. This Is The End: What’s Better Than Actors Making Fun Of Themselves?